This photo was taken about 1949/50 at the Dome. I’m in the front row dressed as a chicken:the tallest one, standing up straight. With the help of Harry Atkins ,I now know the dancing school was called the Bertram School of dancing run by Molly Caulder and was in Black Lion Street, not Ship Street. Although I was about five or six at the time of the photograph, I seem to remember her dressed in top hat and tails doing a tap dance at the end of the show, so maybe that isn’t her dressed as the bride. In the photo second right of the bride there is a person dressed in top hat and tails, that could be Molly.I’m sure someone will know the answer. I was also in the above show lineup with Lolly my friend. Above also were Charmaine,Vicky, and of course I think Tommy was the only boy. The above show was held in Dorset Gardens as were most of the shows. The two girls on the front left that are talking to one another, are standing in front of me dressed as a Gypsy boy . The above picture of the dance school was at one time called the Molly Calder School of Dancing. Molly’s mum was also a teacher when I went there, and we had to follow everything Molly told us with her mum saying “come along everyone watch Molly and copy her.” The hall had these great big mirrors floor to ceiling all around the room, the floor was wooden and the ballet bar seemed quite high too. Later on the name was changed to the Bertram School of Dancing and Molly was then on her own with us. I did Tap and Ballet; great days. Molly’s school was indeed in Black Lion Street and is still there, but the last time I was there it was occuppied by a resturant. Molly was very proud of her school and especially naming it after her father. I have no idea who is who in the photo, but the person in the wedding dress does look most like her. I have some photos of her somewhere taken when she was young so I’ll dig them out and have a look. Her school is still going under the same name, now run by Wendy Tucknott, a former pupil and close friend. Molly passed away in 2002, we miss her greatly but her character is still very much alive in our minds. She would have felt very proud knowing there was a website about her. I am her nephew Terry Caulder. Does anyone remember the Molly Ball School of Ballet? I attended between 1953 and 1961. This was also just off North Street but to the right in a building over warehouses or something similar. I remember in summer days we were allowed to exit down the circular fire escape outside. I have fond memories of grand events put on at the Dome Theatre and smaller ones like garden parties. I attended Molly Balls School of Ballet from about 1953 until 1963. I emigrated to New Zealand in 1964, but now live in Queensland, Australia. How well I remember the Brighton Competions which I did for years both in dancing and singing. I went on in life to become a professional singer. I also remember the fire escape! Lucky thing there were no broken legs from using it! Thanks for your response to my Molly Ball question. I am thinking you may have been older than myself when you started and you seem to have used your talents well, congratulations. I remember going straight to ballet class as school ended and as our class was finishing the older class was arriving for their lessons. I can remember preparing for bigger concerts for the Dome etc. where the older classes would gather so we could all incorporate what we’d learnt and feeling amazed at the bigger dancers and how professional they all seemed, especially when on points. Ballet was not to be my venue this time but I have used a lot of it’s style and character in the art form that I’m busy with and that is world of ‘Spirit Dolls’. I am a Doll maker. I am commissioned to make portrait characters of how I percieve people in their spirit, or nature self. It is work I love. Not so strenuous as Ballet. Do you happen to have any old photos from that period that you would wish to share, either through this web or privately with me. I did have a collection at one time but at 63 I have let so many old snaps go and now wish I could still browse some of them. I attended Molly Caulder’s Bertram School of Dancing from the age of 8 to 11/12. She was an extremely good ‘old school’ teacher. Molly’s dance classes took place in Black Lion Street above some old lock up garages. You had to climb the equally old creaky stairs to the studio with a small changing room and toilet. Bars were attached down one wall with mirrors on another, a piano in the corner with Mrs Braune affixed. Molly’s cantankerous Mother was always in attendance collecting the money for each class. I see that Terry Caulder has written a note about his Aunt (Molly). I remember Terry, he was a year younger than I, if my memory serves, and was ushered in each year to perform in Molly’s Annual Show, which was either held at The Dome, The Art School or Dorset Gardens at the time. I remember performing with Terry dressed as ‘Mr Baggy Britches’ with clogs on and us very young ladies dressed as Dutch girls with blonde plaits and blue and white bonnet hats. Another time Terry was Santa in our rendition of “When Santa Got Stuck up the Chimney”! All very good happy memories. Molly had an absolutely fantastic idea one year for the finale of the show. She had us all dressed as Pearly Kings and Queens in black outfits with white buttons dotted all over sprayed with luminous paint. On the end number of the medley “Doing the Lambeth Walk” the lights were dimmed at The Dome and the ultra violet lights came on providing a spectacle of blackness with the entire dance school on the stage providing moving white dots all over the place. I was onstage but have been told that it looked amazing. Well done Molly! I was Jayne Moore in those days and how happy they were too. My two step daughters attended Molly’s dance school in the sixties along with Wendy and Janice Cox. Keep tapping. Molly was the best. My sister Andrea and myself went to Molly’s dance school in 1960-2. I have pictures of us in one of the shows at the Dome. Strollins, Toytown, Hawaii and I’m forever blowing bubbles were a few of the sets – I have a few pictures. I can also remember Marie Caulder being there, was it Molly’s daughter? I also went to the Bertram School of Dancing and loved it. Molly had a great reputation for being a very good dance teacher. She did shows at the Dome most years and also had pupils entered for the music dance festival held at the Dome, I think in the spring of most years. I have photos of dancers in top hat and tails, chickens, swans, fairy tale characters and pearly characters. I remember doing “Lambeth way” with Josie King. I also remember a Christmas dance we did with “when Santa got stuck up the chimney”. I remember Rosemary Brown, Rosemary Langley, Jackie Norris and someone called Bluebell. Molly’s brother also performed on stage and I can remember him playing the mouth organ and I think singing. Great memories. Just came across this site again after several years. It’s really nice to hear so many memories about Molly. I do remember doing Mr Baggy Britches and Santa got stuck up the chimney and I remember Jayne Moore very well. I never felt at ease with my stage roles and quickly realised I was not destined for fame. Zoe mentioned Maria Caulder – Maria is my sister who also attended the school but I’m not sure when or for how long. Molly never had any children and seemed to dedicate herself to the dancing world she loved. Molly Ball sadly passed away on 22nd December 2015 aged 100. 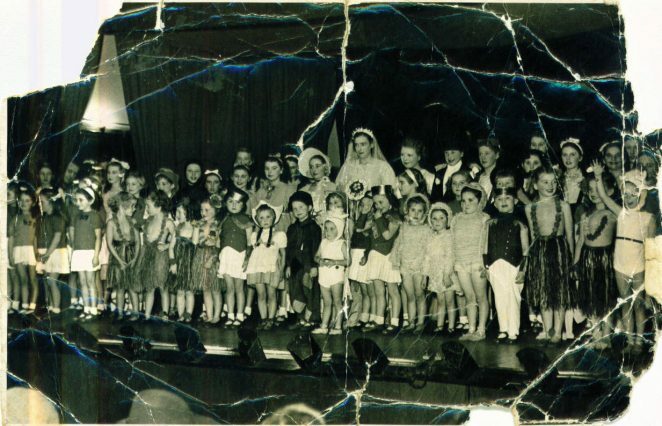 She was a well known dancing teacher in Brighton and regularly visited Dicker House school in Junction Road, Burgess Hill to teach dancing to young boys and girls aged between 5 and 10 years, during the 1950s and 1960s. In 1960, I met John Bernard Ball, her brother, who was the Chief Quantity Surveyor at Fulham Borough Council where I worked for 12 years. He had a daughter Janet who married into the Lupino family, and she became a dancer on T.V. shows and theatres around the country. Molly taught her niece Janet dancing from a young age, and a photo of Molly’s 100th birthday party appeared in the Argus dated 24th April 2015 on page 6, with many of her relatives and friends. She will be sadly missed by all who knew her. Sincere best wishes to friends and family of Miss Molly Ball at this time of her passing. How wonderful it would be to have a page on this site dedicated solely to Molly, her work as a ballet teacher, and all the wonderful achievements that have come from her work. I am sure many of us would wish to honour her with our memories making it a very special page for the historical archives. I like to imagine Molly now teaching the angels some ballet steps. I was a taught ballet, tap and modern by Molly Caulder. Started at 3yrs old by my baby sitter, Aunty Judy, whose daughters went on to dance professionally (Wendy and Debbie, who was briefly in Pans People!). I remember doing the Lambeth Walk, blacking up (not PC I know) to do Alexander’s Ragtime Band, and big showstoppers on high stairs covered in tinfoil at The Dome. I won first places in the Brighton festival through her, I was Alice Bluebonnet to my regular partner, Lesley’s, Johnny Fedora, and I can still sing along with the older patients I now treat as a doctor. Have a banana! Most of my childhood memories are linked to Molly and my dancing adventures, even trips to London to practice with the Royal Ballet School somewhere behind Harrods. I was too young to truly appreciate her for the near 10 years she taught me, and I’m sad she’s not here now for me let her know how special she was, because she really was. I still have my dancing muscles, Molly! I was a pupil at Molly Ball’s dancing school in the 1930s. Born in 1932, I must have been about 6 or 7 at the time. In the class we first did ballet, then tap dancing and finally there were acrobatics. Only the ones good at ballet did the acrobatics and while I would have liked to do that I wasn’t sufficiently interested in the ballet. I don’t think I kept up the dancing for very long, but remember taking part in a performance that Molly Ball put on in the West Pier Theatre. I don’t recall what it was about, but I was dressed up as Nellie Wallace in a tartan outfit with a bustle and a pill box hat which my mother made out of cardboard and was kept on with an elastic under my chin. To think that Molly Ball has died only last year, aged 100! She must have been barely 20 when I went to her classes. Maybe I was one of her first pupils!